Doogee HomTom HT6 is a capabe samrtphone with a whopping 6250 mAh battery! Check it out. Doogee is a trusted brand when it comes to juicy battery packs in a smartphone. Basically the company is banking on its great reputation in providing bigger battery life for its avid followers. 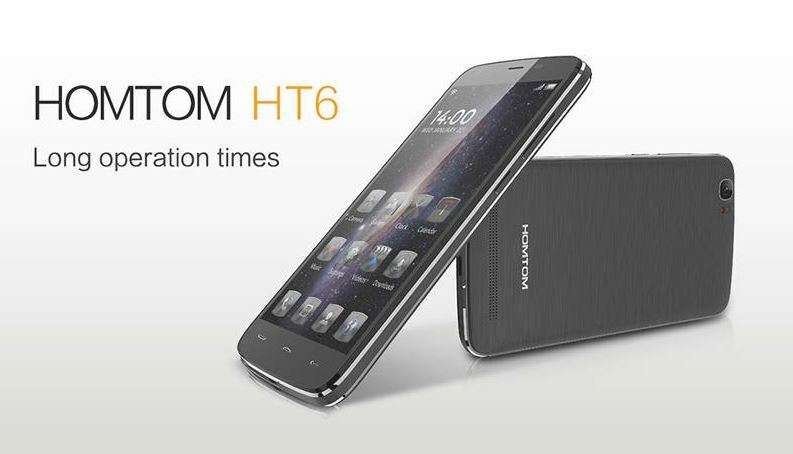 Recently, the Chinese outfit released the Homtom line of smartphones which is spearheaded by a promising handset dubbed as the Doogee HomTom HT6. Basically, the smartphone is being marketed to have a whopping 6250 mAh battery. Doogee has been catching a considerable amount of lightning lately and the Homtom phablet will also not disappoint; it has even withstood the intimidating fame of other low-cost Chinese handsets like Xiaomi, Meizu and Lenovo. The Doogee Homtom HT6 is a good-looking handset with a svelte alloy construction which gives the handset a metallic finish. But other than the pleasing external, it also has the guts to brag about. So what does the 6250 mAh battery has to offer in the table? Well, the company says a lot. It even boasted that this phablet have 7 days of battery life. Knowing that it comes with a big battery capacity, one would also worry about its charging time. But yes, the Doogee is very generous enough to include the Fast Charging capability, which will charge 75 percent of battery in just 30 minutes of charging time. Aside from the battery life, Doogee Homtom HT6 features other hardware that could fair up to other midrange smartphones. For one, it comes with 4G LTE capability for faster mobile Internet connectivity. The phablet ticks with a MediaTek MT6735 chipset which features quad-core processor. Software-wise, the handset is also expected to boot with Android 5.1 Lollipop. In terms of display, the Homtom HT6 tones down a bit with 720 x 1080 pixels. The screen is treated with Gorilla Glass protection which makes it one of the toughest in the market. Talking about the mobile camera, the phablet sports a 13-megapixel sensor in the rear panel as well as a 5-megapixel front camera for social media selfies. Across the board, the handset includes a 16GB internal memory for the user's multimedia files with up to 32GB of expandable storage. Other noteworthy features include the USB OTG, HotKnot and the Bluetooth 4.0 connectivity. For those markets who are dual SIM-friendly, the handset has a dual-standby capability. One slot utilizes a standard SIM card while the other one uses micro-SIM. The Doogee HomTom HT6 is a 4G phablet which comes with a pre-sale price of USD 139.99 in GearBest. This pre-sale offer ends on October 15.